ID card is the vital element of each institution it helps in enhancing the institution security, allow students to build personal connections and streamline the administrative daily operations. ID card is a way through which it becomes easier to determine that whether the students or other staff members are the part of an institute or not, and for what all institute’s amenities they are authorized. But sometimes an ID card program becomes a painstaking task for the administrators, from selecting a suitable template to editing a data on each ID card is not only an exhaustive but also become a time taking process. 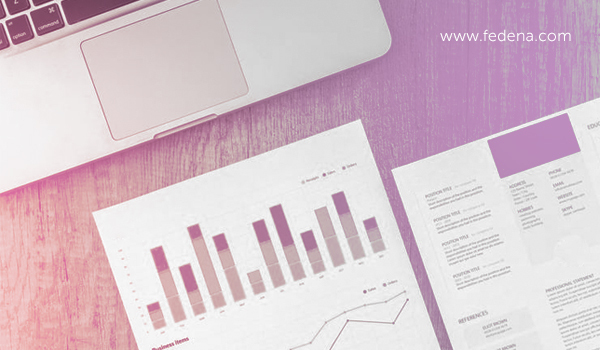 To manage the ID card program, there is various software available in the market which provides plenty of features but sometimes it happens that those features won’t fit best in your institution. 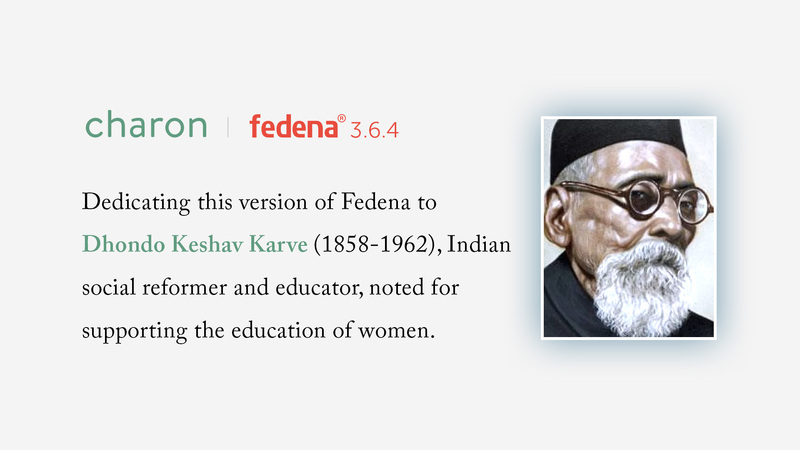 Therefore, Fedena is here with a new module named as ID Card Generator. You can create an ID card template or customise template according to your institute requirements. 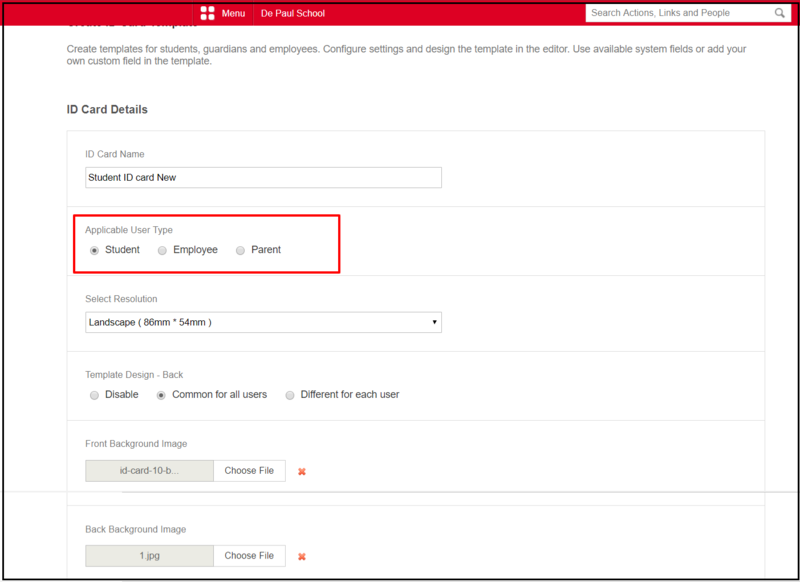 To avoid the data entry error while manually creating an ID card, you can add the dynamic text to your templates using field codes and once the ID card is generated, click on the preloaded student data to finish the card. Also add the images, user photos, barcodes and other custom content to design ID cards that reflect the identity of your institution. In Fedena besides from student and other employees ID card, an institute can create visitor pass, card for the temporary worker and much more. ID card program is the best way to increase and retain the campus security. 2. Give some meaningful name for the ID Card template and select the ID Card type to whom you want to generate the ID Card. Using the editor given below you can design the template as per your requirement. Use the field codes given in the box to design the templates. HTML mode in the editor can also be used for the template design. You can copy the field codes from the box and use it in the editor as per your requirement. To manage the front and back side design of the ID Card separate editors are available. Once designing part is complete click on Create Template to save the template you designed. 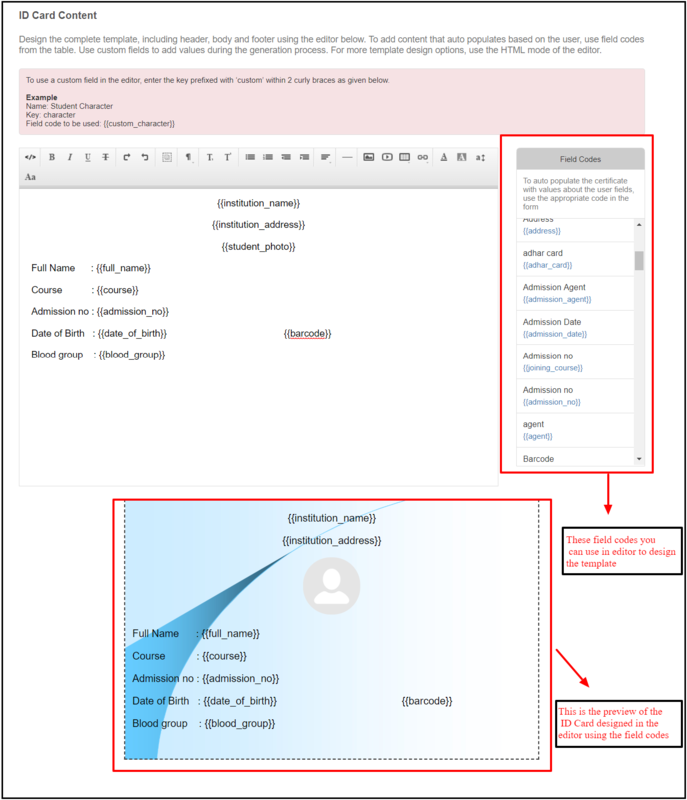 If you have any changes to be made in the template click on the Edit option available in front of the ID Card Template Name. Note: You cannot Edit or Delete the template if you generate any ID Card under that template. So, please make sure that there are no changes in the template before you generate the ID Cards. This option is used when you generate the ID Cards for some particular students. 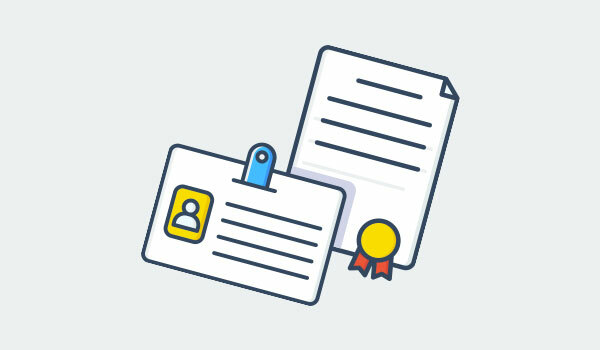 Example: If new Student is admitted to already existing batch in the middle of the Academic Year we can generate his ID Card using Generate Individual ID Card option. This option is used when you generate the ID Cards for a Batch of Students/Employees. Under this option, you can view the previously generated ID Cards and also Required ID Cards can be Regenerated from this option. 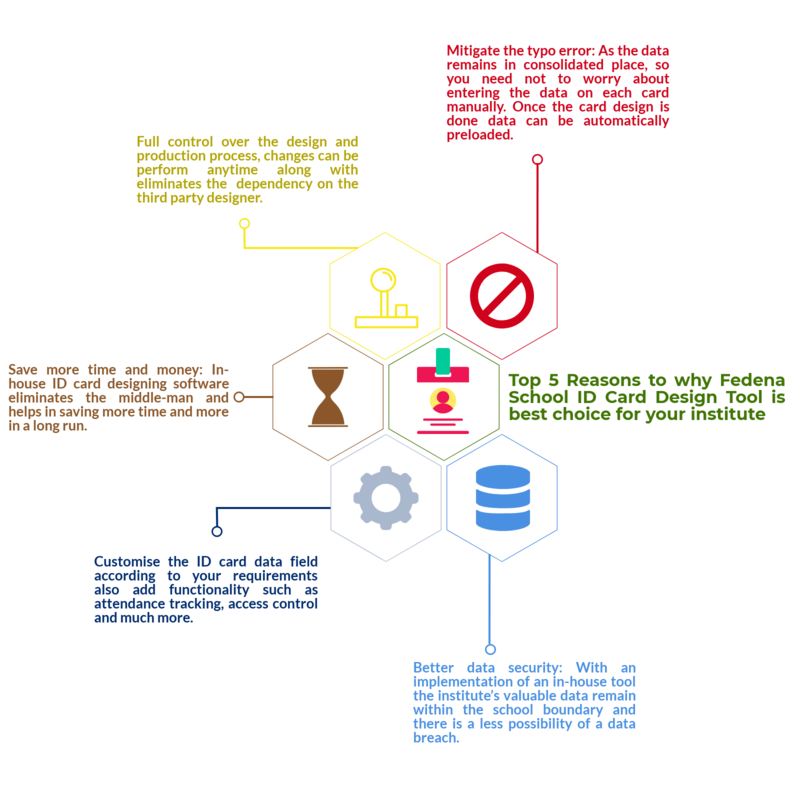 Why Fedena School ERP software to design ID Card? Next PostNext Do Institutions Need Student Information System?